Missionaries Julie Lutz and Marie Dicke receiving a gift from Sukutea (Resurrection) Lutheran Church, Yaramanda thanking the LCMS for bringing the Good News to the Enga Province in November 1948. 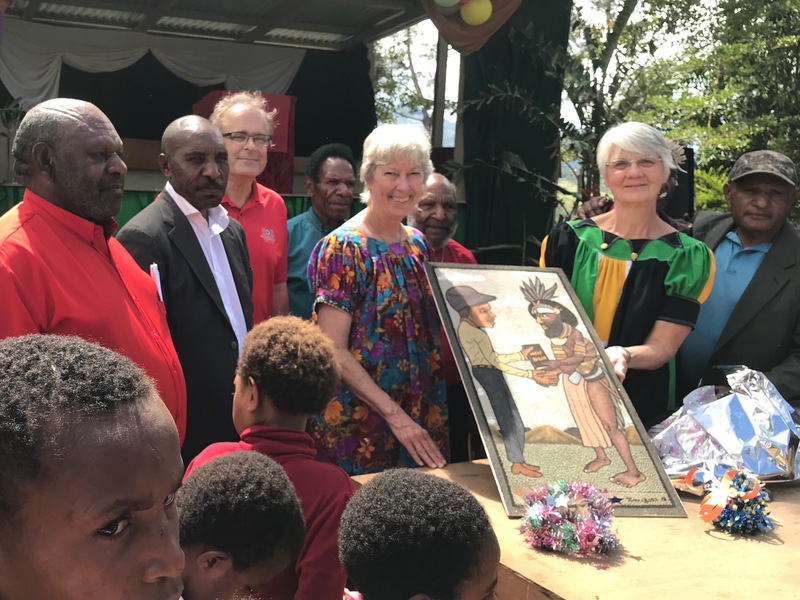 In April 2017 my wife Marie and I returned to Papua New Guinea where I was born to serve as music missionaries to the people of the Enga Province and the Gutnius (Good News) Lutheran Church. Below you find links to all of our newsletters and many other aspects of our ministry. As this year comes to a close, please prayerfully consider a Christmas donation or a special year-end gift so that we can continue to proclaim God’s love to the people in Papua New Guinea. Your prayers are an encouragement to us and your generous financial support allows us to share God’s love and mercy to the people here. One-time or recurring gifts may be made securely at lcms.org/dicke or missioncentral.us/dicke. Please also consider supporting us in the coming year. The needs here are very great. Thank you for sending us and making it possible for us to share the message of our crucified and risen Savior Jesus Christ with those in Papua New Guinea. Click here for our most recent newsletter. To become a Prayer Partner or subscribe to our newsletter, visit http://eepurl.com/b9Y4X1. You will find links to all of our other newsletters below. Visit www.facebook.com/DickesBacktoPNG for lots more photos, videos, and stories. If you are not on Facebook, click here. After a security check you will be taken to our page. If a screen comes up asking you to subscribe to Facebook, just click “Not Now” and you will be able to see our page. For the most recent PowerPoint presentation on our mission work, visit https://1drv.ms/f/s!AtolSvirHILjsF_Hu3JzZeDeY4jm. https://www.kfuo.org/2019/03/06/wlnd-030619-photojournalism-in-papua-new-guinea – Interview with LCMS official photographer Erik Lundsford regarding a recent trip to the Enga Province of Papua New Guinea. https://lcmsasia.fireside.fm/18 – Podcast on “Sanguma” featuring LCMS missionary Anton Lutz. https://lcmsasia.fireside.fm/14 – Podcast about Pastor John Mos, a bush pastor from the Papaki Circuit in PNG. See our March 2018 Newsletter for pictures and more details. Pastor Mos ministers in the Papaki Circuit, a two-day hike through the bush from the Wanakipa airstrip (see the video One Stone at a Time). 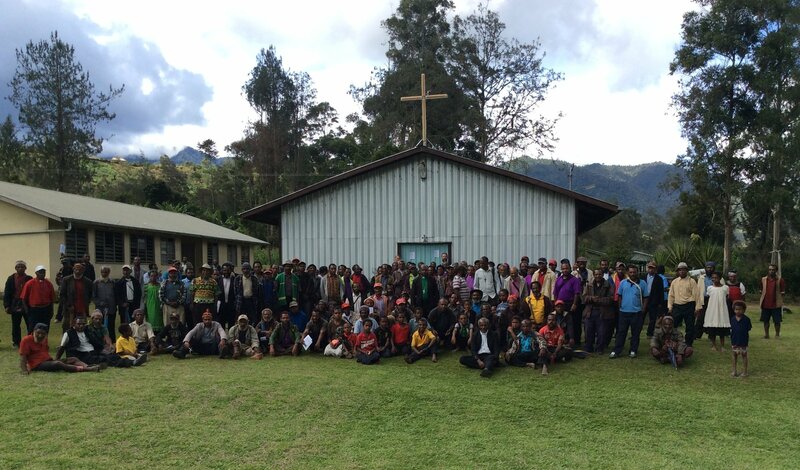 www.lcmsasia.fireside.fm/13 – Podcast about Pastor Philip Lyilya, a bush pastor from Yuyane in the Porgera Circuit of PNG. Click here for some videos of our mission work and mission work in PNG. To view and/or download literature that we have been producing for the churches and schools of Papua New Guinea, click on the links below. Please feel free to share them with your family or use them in your own churches or schools. These documents are sized for A4 paper, the standard paper used in PNG. If you would like copy on Letter (8½ x 11) paper, please write to me at martin.dicke@lcms.org. Click here for an archive of our latest Prayer Requests and Ministry Emails.